Now firmly on the tale end of our Tale of Four Warlords I knew I had to kick it into gear and make sure I finished this army on time. While my plan of a unit a month was solid, I knew from the get go that there would be one month where I would have to double up and tackle a few units at once. December seemed like a good time for that so that I wasn't rushing to get things done come February and March. 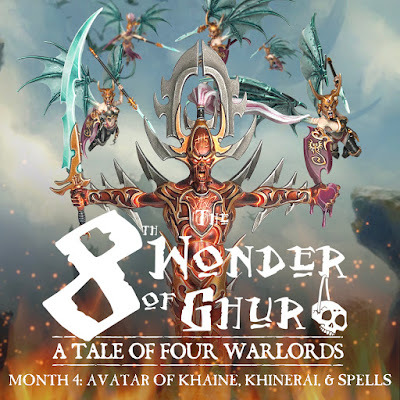 So this month I have the Avatar of Khaine, Khinerai Heartrenders, and an Endless Spell! First up was the Avatar. I knew this guy was going to be my centerpiece for the army, mostly because I don't plan on having a Cauldron or Shrine in my first 1,000 points, so he was going to be the largest model. I love the idea of big, stompy, animated statues. It must be the Tomb King in me. I actually started the Avatar at the tail end of November since I had some time to fit him in. 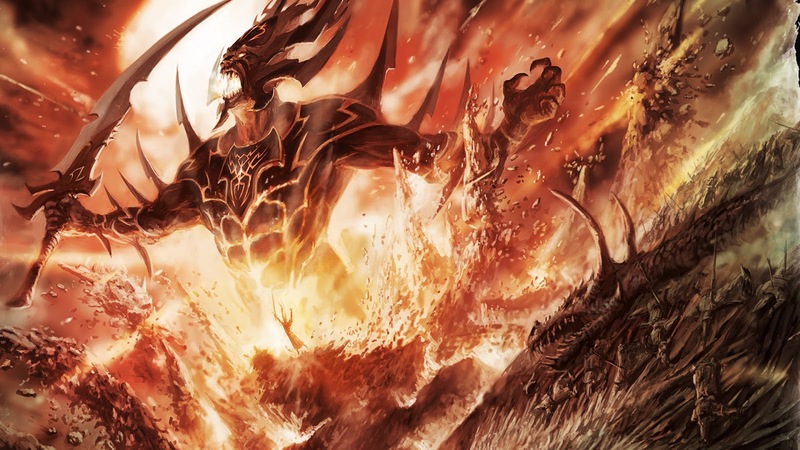 This piece of art from the End Times series was a big source of inspiration for me on what I wanted to accomplish. I really liked the molten look, like it's burning from the inside. I decided to go for a metallic feel, with the molten core showing through on areas that didn't look like armor, such as his face, hands, abs, and arms. I'm really happy with how it turned out. I will have a little tutorial on my Twitter and Instagram going over how I painted to molten areas, but the basic gist is a lot of washes over a Retributor Armor basecoat, and then going back in with oranges and yellows for the glow. His armor involves a lot of layers of wash, mostly red and black, and then a few highlights. Once I got to the sword, hair, and heart I was a little stumped. Originally I was going to do the hair to look like fire, but decided to go for the pinkish white to match the rest of my army. I also used the heart as an area to bring in the Screamer Pink color I used on all of the cloth of my models. Lastly, the sword was painted to be crystal to match my heroes and other important units. 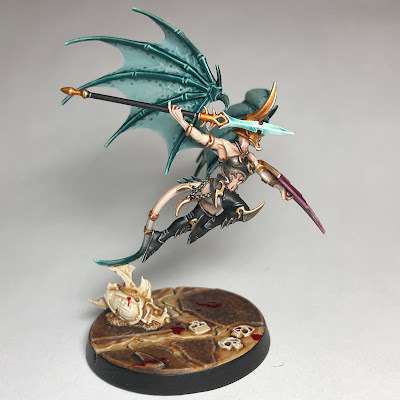 It also brings the green of the snakes in, tying all of the major colors into the model. I'm really happy with how it turned out. It stands out from the rest of the force in a way that a centerpiece should, but not so much that it looks out of place. Next I decided to do a quick Endless Spell. I knew I was going to have 20 points leftover when I was all done, and I wanted a bit of a break before diving into another complex paint job. 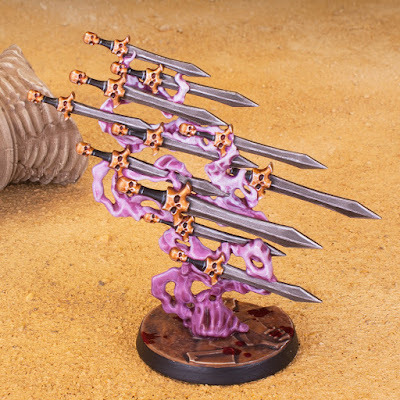 The Quicksilver Swords are actually the first Endless Spell I have painted from the main set. I didn't want to spend a ton of time on them or put in too much effort, so I went for a pretty simple look. The swords are painted just like all my other metallics. I did consider making them crystal for a moment, but that would have taken a lot longer for something that may not see use in every game. For the smoke I wanted to tie in my army colors, so I made a wash out of Screamer Pink and Lahmian Medium. 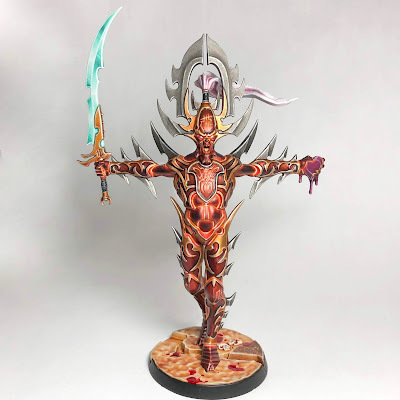 I did more layers of it the further down it went, darkened down a few other areas with Carroburg Crimson, and mixed in Ulthuan Grey and White Scar for the highlights. Last, but not least for the month are the Khinerai Heartrenders. I knew these gals would be a bit involved and I was definitely right on that part. I considered leaving the wings and arms off for subassemblies, but I wanted to make sure all of the gaps were filled in since there are quite a few in odd spots. These gaps aren't huge at all, but my OCD wouldn't let me leave a line running across a shoulder or any area like that. In the end only a few heads and spears were left off, but otherwise they were assembled fully. There's nothing new with this unit for paint recipes. I followed the same recipes I used for my Witches and Blood Stalkers for all the various parts. The only new thing I added was the mottled pattern on the wing membranes. I did this to break up the large flat areas and give it a bit more visual interest. I simple used a mix of Coelia Greenshade and Lahmian Medium and dappled it on in a random pattern. I debated giving them regular metal spear tips, but decided that they constituted an elite unit and should have the crystal ones. They took a bit longer then I expected since I had to be really careful when painting all of the fiddly bits, but again, I'm really happy with the end result. Lathori Bloodsorrow weaved aside as the ogor bulled its way past her, its massive bulk missing her by a hair's breadth. Spinning around she slashed at its back, her knife punching into its flesh. Hefting herself upward, the hag queen plunged her blade down again and again, ascending the ogor's back as if climbing a bloody mountainside. Upon reaching its head she slashed open its neck in once graceful crimson arc. The dying ogor crashed to the ground in a heap, ploughing through the dirt and snow as its momentum carried it across the battlefield. Pushing off with one foot, the aelf launched herself through the air, landing mere feet in front of the brute, her blade dripping gore. As well as her own battle had gone, she could see that the wider conflict was not faring as well. The Beastclaw Raiders were on the verge of running rampant through their lines. 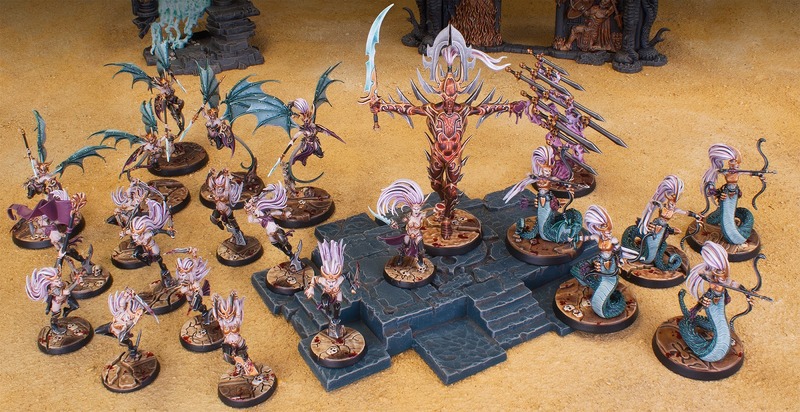 Narochi's coven were handling themselves well, but even their ballet of bloodletting was straining to contain the unstoppable mass of brutes. A shout drew her attention to her right where a trio of mournfang riding ogors rampaged through Corus' Blood Stalkers. Numerous arrows protruded from their shaggy hides to little affect as they tossed one of the serpentine archers through the air, her body bouncing off a nearby cliff face like a rag doll. The snow began to swirl around them with renewed vigor as the accursed everwinter that followed the migrations of the ogors caught up with them. Through the growing blizzard haze a monstrous shadow began to take shape, shaking the ground as it approached. Large, curling horns scooped down from a craggy face framed in a matted white pelt while atop its back a large ogor jabbed its meaty fingers at the battle around it, shouting out orders in its crude tongue. Out of the buffeting winds Sholli Doomhand's Heartrenders hurled their javelins, striking the thundertusk in its side. Despite the added velocity from their aerial descent the beast was unfazed. A lucky javelin impaled the ogor in its shoulder, eliciting a howl of pain before he turned his beast to face the new threat. Lathori could only watch as a vortex of unimaginable cold erupted from the thundertusk's maw. The khinerai scattered to the winds, their payload unleashed. Despite their agility, one of the heartrenders was caught in the freezing blast, her limbs turning to ice. Dropping like a stone she shattered upon the rocky ground in an explosion of bloody chunks. 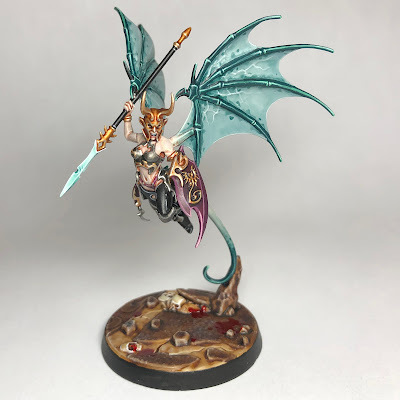 Sensing the direness of the situation the hag queen sang a prayer to Khaine, bracing herself for combat as the beast approached. As she finished her benediction a tremor ran through the ground and a growing haze of heat began to push back against the winter storm. The thundertusk slowed its stampede as it looked around in confusion while the ogor upon its back bellowed, smashing his burly fists into its head to try and get it moving again. Suddenly the outcrop to its side exploded in a shower of rocky shrapnel, a glowing shape barging its way through. 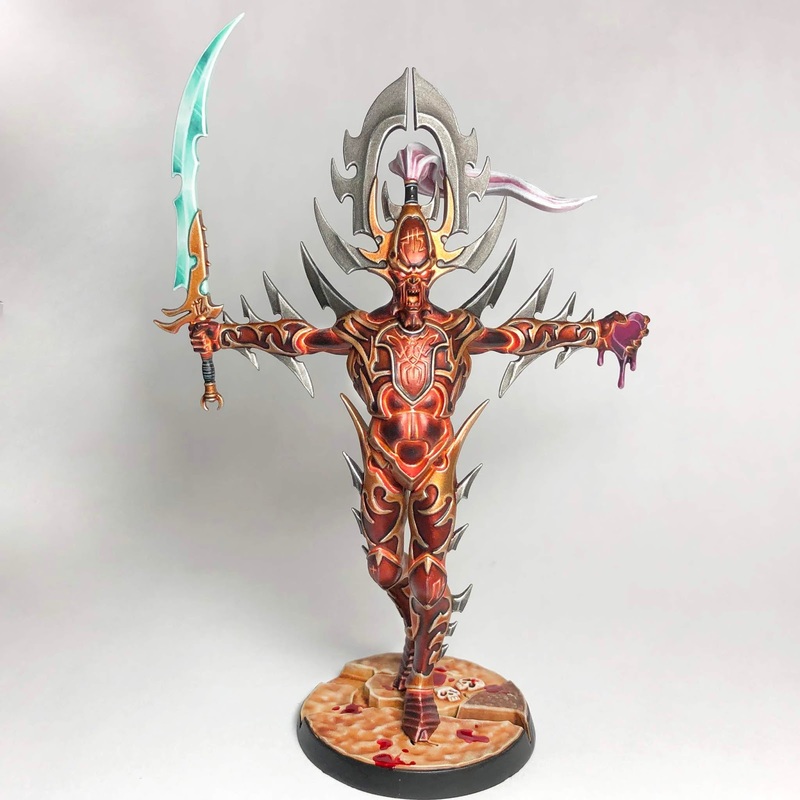 The avatar of Khaine strode forward with purposeful determination, its molten core eating away at the cold around it. Grabbing the ogor in one massive hand the animated statue hurled the brute off of its seat, before punching into the thundertusk's face with bone crunching force. Reeling in pain the beast yowled in pain. 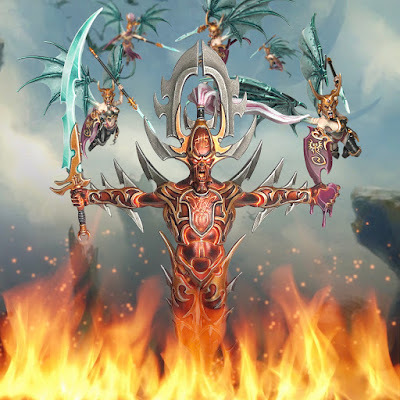 As it attempted to bring its bulk around the avatar raised its crystalline sword and brought it down in a brutal hack, nearly severing the monster's head clean through. Twice more it struck, before finally the beast keeled over, the bloody stump of its neck coating the ground in gore. Seeing their leader fall, the resolve of the rest of the ogors began to waver. Some turned and ran, while others looked on in disbelief just long enough for the aelves to turn the tide. The avatar merely continued its rampage, molten fire pouring from its mouth and its sword carving a bloody swathe through the ogor's ranks. A small smile crept over her face as Lathori drew her blade, preparing to join the slaughter. "Praise Kaela Mensha Khaine." Here's my army so far, with only 3 more units to go! My Sisters of Slaughter are on my painting desk right now and should be my sole contribution for January. The Tale of Four Warlords has definitely helped me focus on getting this army done and I'm really excited to see them all together at the end. 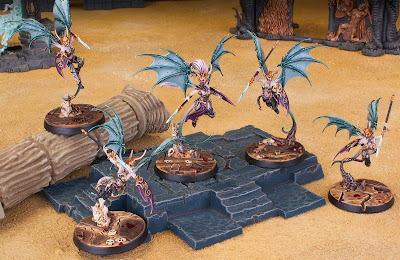 The final thing I plan on doing for the Daughters of Khaine is a display board, which will probably be in March, but I may start rocking on it between the remaining units so I'm not rushing at the end. 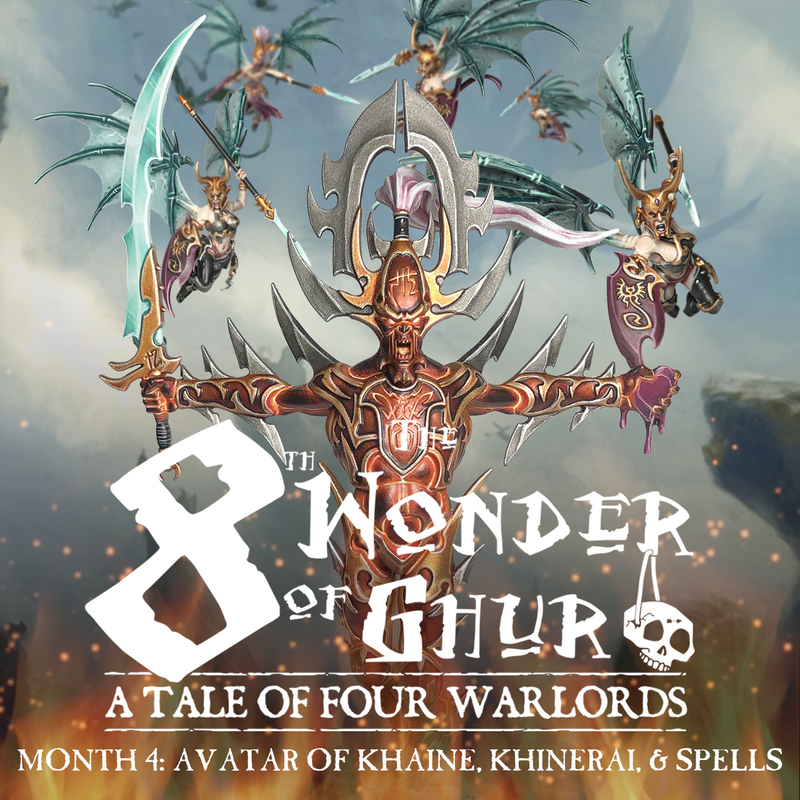 Be sure to check out Eric's aelven take on the Kharadron Overlords here, and Mitzy and Jimbo's grots and Stormcast respectively here!